Your iPad camera and a computer aren’t the only sources of photos. 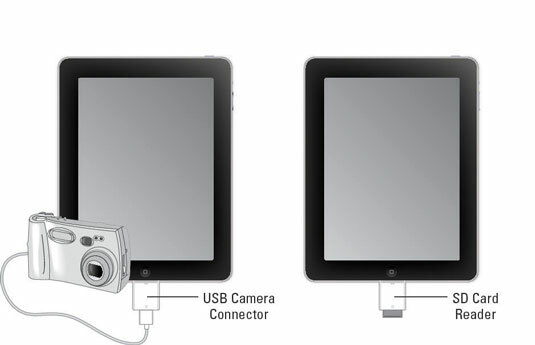 You can import photos from a digital camera and photos or videos from your iPhone/iPod touch if you buy the iPad Camera Connection Kit from Apple, which will set you back about $29. The kit contains two adapters (see the figure): a Lightning to USB Camera Connector to import photos from a digital camera or iPhone and an SD Card Reader to import image files from an SD card. These two adapters are included in the Connection Kit. Start the import process by putting your iPad to sleep using the switch on the top-right. Insert the USB Camera Connector into the Dock Connector slot of your iPad. Connect the USB end of the cord that came with your digital camera or iPhone into the USB Camera Connector. Connect the other end of the cord that came with your camera or iPhone into that device. The Photos app opens and displays the photos on the digital camera or iPhone. Tap Import All on your iPad. If you want to import only selected photos, tap individual photos, and then tap Import. Finally, tap Import rather than Import All. The photos are saved to the Last Import album. Disconnect the cord and the adapter. You can also import photos stored on an SD (secure digital) memory card often used by digital cameras as a storage medium. Simply put the iPad to sleep, connect the SD Card Reader to the iPad, insert the SD card containing the photos, and then follow Steps 5 through 7 in the preceding list. Though not promoted as a feature by Apple, people have discovered that you can also use the USB connector in the Connection Kit to connect some audio devices such as speakers or headphones, and to hook up some USB-connected keyboards that have lower power consumption. Some media readers will also allow you to get photos off compact flash drives, memory sticks, and SD and xD (an older Flash memory card format) cards. Remember that with AirDrop you can quickly send photos directly from your iPhone 5 or later to your iPad (fourth-generation or later, or mini) as long as the devices are near each other.